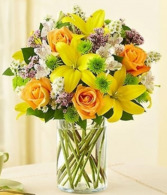 Say, “I love you” with our bright and beautiful bouquet. 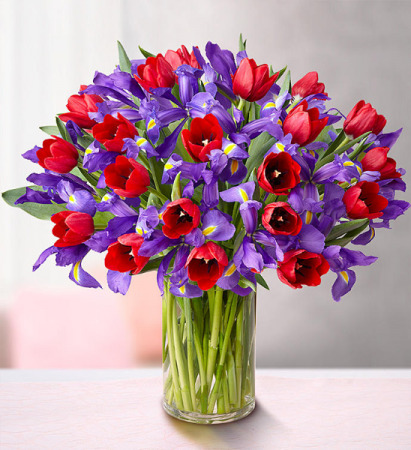 We’ve gathered stems of rich red tulips paired with stems of vibrant blue iris. One look and your Valentine will know just how much you care. Presented by Bloomnet. 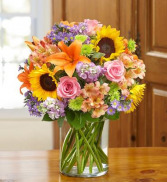 Just in time for Fall, our bestselling arrangement becomes a brilliant blend of roses, lilies, alstroemeria and poms, bringing to mind a colorful European flower field at the height of the season. Artistically designed in a sleek clear glass cylinder vase and accented with natural hand-tied raffia. 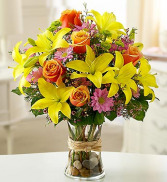 The freshest roses, lilies, alstroemeria, poms, waxflower, monte casino and salal. Presented by Bloomnet. Our captivating arrangement of fresh lilies, roses, poms and more is a stunning tribute to the style found in flower markets across Europe. Gorgeous gathering of lilies, roses, daisy poms, button poms, waxflower and salal. Artistically designed by our select florists in a clear glass gathering vase featuring river rocks and tied with raffia.